Housed in a new warehouse/office condominium development, our task was to transform this utilitarian space into a dynamic office environment on a budget of $43.00 per square foot. As a company that makes its living with paper, it was important the office design reflect an environmental consciousness of renewable resources. 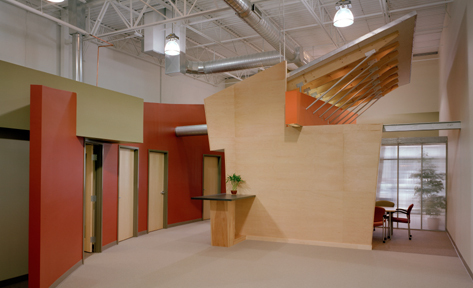 A bold colored, curved wall moves the inhabitant’s easily from the public area of the administration space through to the more private working environment.